Your garden is one of the areas of your home that require special attention. This is because it is the highlight of the outdoors in your home. As a result, you have to take proper care of it. Most people think that taking care of their gardens simply means ensuring that it is well manicured. While tending to your garden is part of the process, it is imperative to note that you need to do more to enjoy the best outcome. Outdoor lighting, for instance, is also an important aspect of your garden. This is because it adds glamour and attractiveness to your garden, especially at night. If you are looking to upgrade your garden, you can have clfservices.com.au install proper lighting to improve its appearance. Outdoor lighting allows you to stay in your garden even at night, and it helps to illuminate the outstanding features on your garden at night. One of the ways to illuminate your garden at night is through an outdoor fire pit and string lights. A fire pit on your garden can be one of the coziest places to relax at night. You can complement it with overhead string lights that will help to bring extra light to your garden. You can also extend the string lights to other parts of your garden, thus allowing them to illuminate sections of your garden such as the walkway. They bring out a decorative effect on your garden, thus making it more pleasant. If you love relaxing in your garden in the evening, you can get some garden seats to enjoy every moment in your garden. Another creative, yet effective way to light up your garden in the evening is by placing hanging tea-light candle chandeliers on the trees in your garden. This is one of the simplest ways to light up your garden, and it requires no special skills. You will just need several glass jars, tea light candles, some sand, and chains. This type of lighting can be placed on any overhanging bough on your garden because you don’t need any wiring. You should fill the glass jars partially with some sand, then place the candles on top of the sand and light them. The candles will light up your garden well, especially when you’re having a romantic dinner. Do you have a seating space under a tree on your garden that provides you with some shade when it is sunny? If you do, you can also enjoy this space at night by adding tree string lights. The tree string lights are properly set on different branches on the tree, thus illuminating the seating space below them. When you light up your garden in this manner, you create sufficient space that you could use when having dinner with your friends or make it a private space for you and your friends to hold conversations. After all, the lights will complement the aesthetic quality of your garden at night. Are you always looking out for ways to conserve the environment? If you are, what better way is there to light up your garden in an eco-friendly manner than using solar pathway lights? These lights rely on solar power to run, which is a plus because they don’t add anything to your electricity bill. The solar pathway lights are also easy to set up. You should place them along the pathway on your garden, and on both sides of the walkway. Such lights also enhance visibility at night, thus increasing your safety. Moreover, they improve the outlook of your garden. The best part is that it is easy to find suitable solar lights for this lighting solution that suit your needs and spending limit. 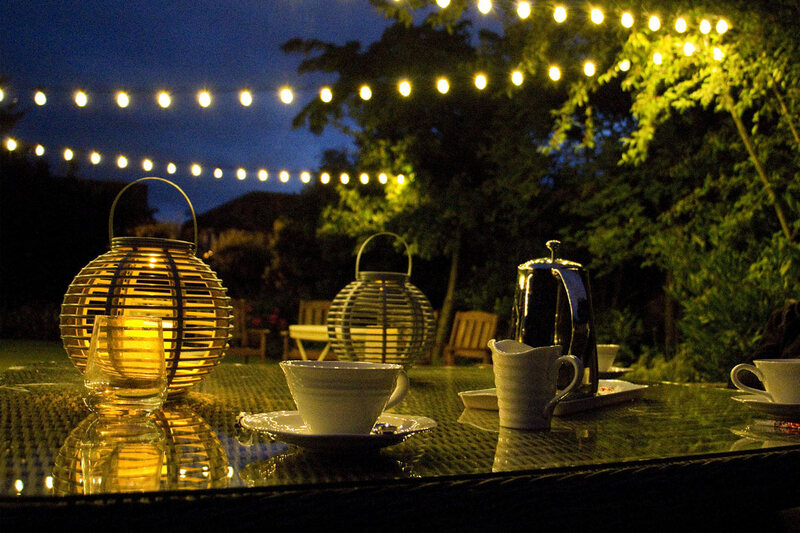 Festoon lights are another way to light up your garden in the evening. They give your garden a classic look, which could be the envy of most people. Festoon lights are commonly used to light up outdoor events such as parties and weddings, and this gives you more reason to want to use them to light up your garden. Festoon lighting might be the solution for people who wish to add character and charm to their gardens. The lighting provides a relaxed mood, which serves right when you’re having dinner with your friends and family. Festoon lights have bulbs that feature copper wire LEDs. Lanterns make lighting up your garden a very easy task. Interestingly, you can choose from a wide array of lanterns to bring light to your garden in the evening. For instance, you can use Chinese lanterns, Moroccan lanterns, and LED lanterns among other types. Lanterns give your garden a festive atmosphere. Additionally, they make your garden look interesting by adding color. You can go for lanterns that use candles or LED lights. The choice is yours. Moreover, you can choose the style of lanterns that best appeals to you and works well with your garden. They are also easy to move, which makes setting them up very easy. Do you have several trees in your garden? If you do, then you know that they provide excellent shade during the day, which means that they can make your garden darker at night. However, this doesn’t always have to be the case. You can light up your garden by wrapping several tree trunks with string lights. You’d be surprised by how they illuminate your garden. While at it, be sure to place these lights close to or below the eye level. This helps to magnify the effect of the string lights, thus delivering a classic look. It also provides you with a pleasant feeling of calmness, thus transforming your garden and making it ideal for outdoor events.